Is America shortchanging vets on health care? Early this year, The Washington Post exposed shockingly substandard treatment for wounded veterans at Walter Reed Army Medical Center's outpatient facilities. Follow-up investigations soon turned up evidence that problems extended beyond shabby conditions at the military's top-drawer hospital. On the battlefield, military surgeons are saving many more lives than ever before. 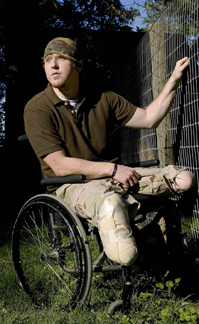 But once they return home, men and women recovering from sometimes devastating war injuries confront a red-tape jungle of laws and regulations. Moreover, many wait months for treatment or benefits, and some even have had reenlistment bonuses withheld after wounds forced them out of active service. A history of disgraceful treatment of veterans of past wars, including the Vietnam conflict, looms over the issue. Amid the present uproar, a presidential panel on military and veterans' health care has called for far-reaching changes, but some critics say changes need to go deeper if the country is to live up to its promises to its troops.